From late April to mid May 2018 my wife and I were in Uganda. This was my 6th visit to the country. On the first, in 1994, I travelled to Kampala from Mombasa on the railway. It was a fantastic journey in a slow moving train with silver service in the dining car and with beds made up for us by staff each night. There were two separate trains, a njght train from Mkmbasa to Nairobi run by the then Kenya Railways and a train from Nairobi to Kampala run by Uganda Railways. This short series of posts tells the story of the line to date and looks forward into the future. In recent times the railway system in Uganda has had a chequered history and had been relatively badly managed, as you will see. The present network is in a delapidated state. The network is shown in the image below. The country has about 1,350 kms of railway lines and most of it has not been operational for over 25 years. Repairs had been completed on the Tororo-Gulu line and were still ongoing on the Gulu-Pakwach Line in early 2014. The railway originating at Mombasa on the Indian Ocean connects to Tororo in Uganda, where it branches westward to Jinja, Kampala, and Kasese and northward to Mbale, Soroti, Lira, Gulu, and Pakwach (to the south-east of Arua and on the northern edge of the Murchison Falls National Park – the Pakwach Bridge crosses the White Nile close to the town). There was no chance, in our recent visit, for me to check out the railway system. After a very short stay in Kampala we spent the rest of our time in the south-west of the country in Kyegegwa, Rukungiri and Kisoro. Back in 1994, I was taking slides and being very careful not to exhaust my supply of film. How much things have changed! 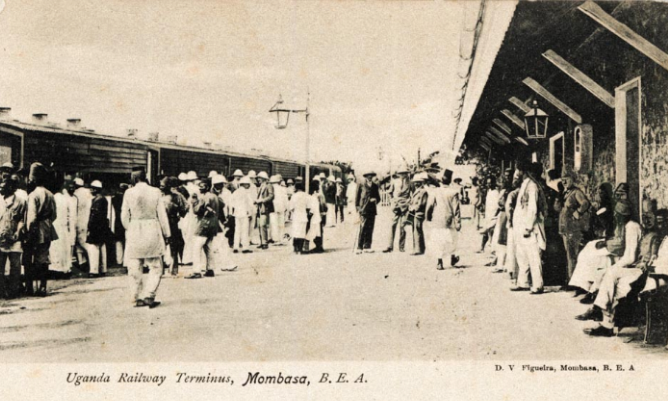 I do have four pictures, taken at Mombasa railway station, of coaches from the early to mid 20th Century which were stored among slightly more modern stock, at least three seemed still to be in use. ….. 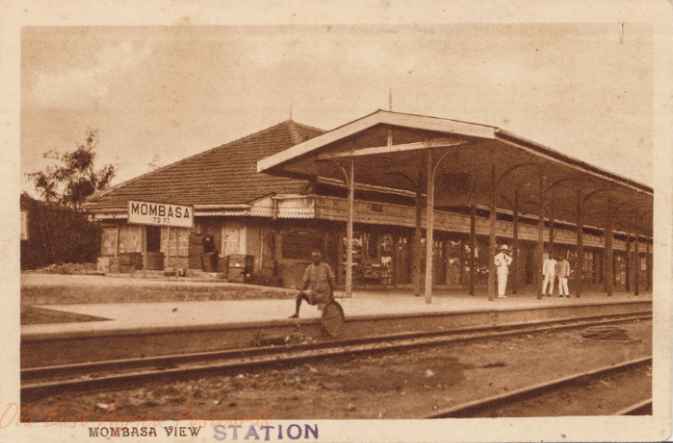 The last photo above is courtesy of Jennifer Wu (https://www.flickr.com/photos/wippetywu/8333244855), those below are some early postcards of the station in Mombasa. The Uganda Railway was named for its ultimate destination. Its original length of 660 miles (or 1056 kilometres) lay entirely in what we now call Kenya. Construction was carried out principally by labourers from the Indian subcontinent, 32,000 of whom were brought in because of a lack of local labour in very sparcely populated areas of East Africa. The horrendous truth is that the line was built on the lives of those labourers. 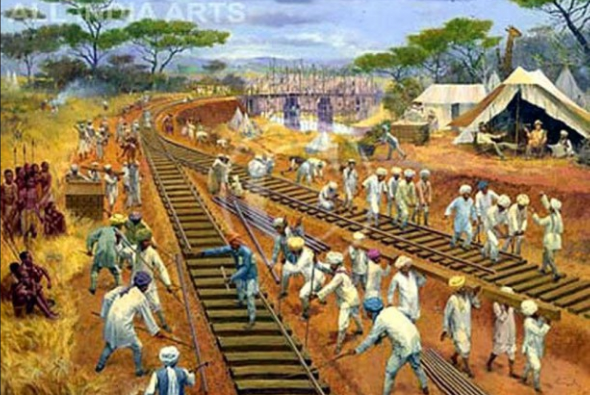 2,498 workers died during the construction of the railway., An artists impression of the work is shown in the image below (courtesy of Charan Kundi). Many of the labourers returned to India but 6,724 decided to remain after the line’s completion, creating a community of Indian East Africans. The railway line had a significant impact. It effectively created Uganda and Kenya as the countries that they became. As we have already noted, the railway defeated the slave trade in British East Africa. It allowed heavy equipment to be transported with relative ease. The use of indian sub-continent labour resulted in a very significant minority of Asians in East Africa. These Indians worked as “dukawallas” (shopkeepers), artisans, traders, clerks, and, finally, lower-level administrators. Excluded from the middle and senior ranks of the colonial government and from farming, they became a commercial middleman and professional community. The British administration encouraged European settlement and farms were set up for coffee and tea production with the railway available to ensure easy shipping to Europe for processing. As the numbers of settlers and farms increased native populations became alienated from their land and seeds were sown for the later struggle for independence. At the same time, inceeases in white settlement made demands on the railway. New small stations were required to allow transportation of agricultural produce. These stations included: Nakuru, Naivasha, Tigoni, Kijabe and Sigona. In addition, the railway contributed to increased urbanisation. Many of today’s towns in Kenya, and some in Uganda, have reulted from the presence of the railway. 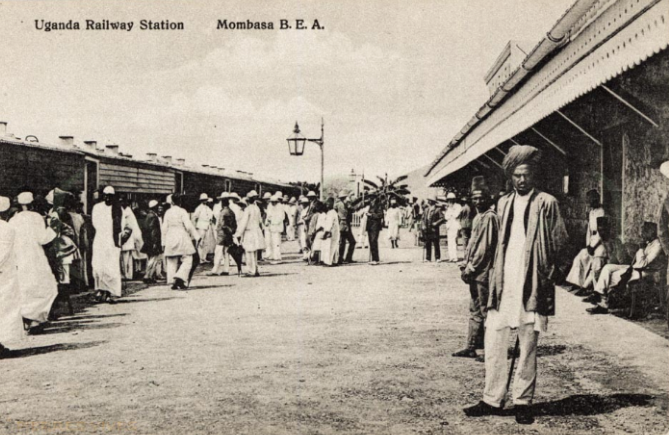 Mombasa urbanisation can be traced to the start of the construction of the line. Nairobi was a rail depot placed in the middle of a swamp, and is now the capital of Kenya. Other towns for which this is true are … Kikuyu, Naivasha, Nakuru (where the main line splits, one branch going to Kisumu and the other to Uganda), Nanyuki, Eldoret (originally called “64″ its distance, in miles, from the railhead at the time), Kitale (a small farming community in the foothills of Mount Elgon), Kisumu (then called port Florence, a city and port on Lake Victoria allowing ferry transport between Kenya, Tanganyika (modern Tanzania) and Uganda), Port Bell (a rail-linked port, near to Kampala, on Lake Victoria allowing ferry transport between Kenya, Tanganyika and Uganda), and Jinja. We have already heard that close to 2,500 of the 32,000 workers on the line died during its construction. There are two particular causes worthy of significant note. The first concerns the death of a number of conctruction workers in 1898 during the building of a bridge across the Tsavo River. Hunting mainly at night, a pair of maneless male lions stalked and killed at least 28 Indian and African workers – although some accounts put the number of victims as high as 135., The picture above shows one of the two lions and Lieutenant-Colonel John H Petterson who killed it. 1. Lucy Styles, Uganda Railway Assessment, January 2014 (updated to June 2015); http://dlca.logcluster.org/plugins/servlet/mobile#content/view/3375402, accessedon 8th May 2018. 2. Wikipedia, Uganda Railway; https://en.m.wikipedia.org/wiki/Uganda_Railway, accessed on 6th May 2018. 3. Richard T. Ogonda & George M. Onyango; Development of Transport and Communication. In William Robert Ochieng’; Historical Studies and Social Change in Western Kenya. Nairobi: East African Educational Publishers, 2002. p219–231. 4. Richard T. Ogonda; Transport and Communications in the Colonial Economy. In William Robert Ochieng’ & R. M. Maxon; An Economic History of Kenya. Nairobi: East African Educational Publishers, 1992. p129–146. 5. Christian Wolmar; Blood, Iron & Gold: How the Railways Transformed the World. London: Atlantic Books, 2009. 6. Frank Richardson Cana; British East Africa. In Hugh Chisholm. Encyclopædia Britannica. 4 (11th ed.). Cambridge University Press, 1911. p601–606. http://www.enzimuseum.org/archives/275, accessed on 8th May 2018. 8. Man eating lions – not (as) many dead; Railway Gazette International. 27 November 2009. http://www.railwaygazette.com/news/single-view/view/man-eating-lions-not-as-many-dead.html, accessed on 8th May 2018. 9. David Kaiza; End of Lunatic Express; The East African. 21 September 2009. http://www.theeastafrican.co.ke/magazine/-/434746/660876/-/view/printVersion/-/32dc3d/-/index.html, accessed on 8th May 2018. This entry was posted in Railways Blog, Uganda and Kenya Railways on May 9, 2018 by rogerfarnworth.